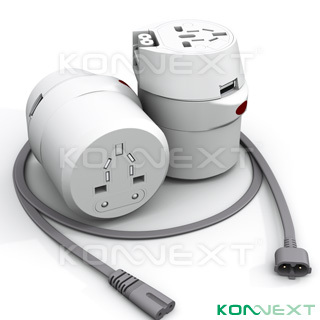 The new Konnext™ AdapterOne™ Portable Travel Power Strip with USB Charger keeps you connected in over 150 countries. The unique one piece design design offers extraordIHAry travel storage convenience and the patenting pending “Twist & Release” mechanism allows user to select 4 different socket styles effortlessly. Built-in 3A fuse protection circuit ensures safe power connection for your mobile devices from Australia to Zimbabwe.